What are Rome apples like? Flavorful and mildly tart. Rome apples have dry-ish flesh, so they are definitely not best for juicing. When added to applesauce, they will impart a pretty pink color and thicken the sauce nicely. 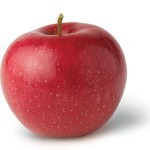 A Rome apple’s firm, white-pink flesh retains its shape beautifully when cooked. Great for applesauce, apple butter, pies, baking and freezing. 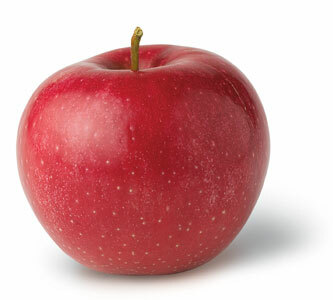 Try combining Rome apples with a sweeter apple, like Golden Delicious or Mutsu for delicious applesauce or butter. These apples are grown by a family that we’ve worked with for several years now, and we’realways really happy with the quality of their fruit. As is the case with most of our other ‘conventional’ fruits, these apples are grown using a method of farming known as Integrated Pest Management, which makes it possible to spray minimally. You can read more about IPM here. Fresh storage – it’s pretty easy if you have the fridge space or if you wait for cooler weather. See how our neighbor, Wilda, keeps her apples.